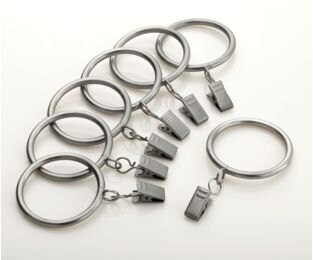 Listing is for a pack of curtain rod rings for a curtain rod up to 1 3/8" in diameter. Each pack contains 7 rings in any of the finishes listed. Clips are removable in order to add drape hooks for a more stable and professional drape look. Curtain hooks can be purchased here https://www.etsy.com/listing/156719979/drapery-hooks?ref=shop_home_active&ga_search_query=hooks.